In my journey into the world of Baroque (see Baroque and Roll article) I had a soft landing with Caravaggio. I was already a devotee and now, by virtue of living in Rome amidst churches where his paintings still hang, I have become an obsessive. Caravaggio makes sense to us without any art historical preamble and he is not a slow burn. You fall for him as soon as you have witnessed one of his masterful renderings of biblical stories playing out in his own modern world – dark scenes in dodgy roman taverns where prostitutes, rent boys and his mates unashamedly play the parts of holy men and women, spot lit as Caravaggio redefines composition, pathos and story telling in painting. He is the greatest painter of the Baroque but to know Caravaggio in the context of his times is actually not necessary given how intoxicating his paintings are. There is no need to know the politics, religion and society of his age in order to unlock his work because you get pulled straight in. Caravaggio was always conscious of the viewer, he creates space for you, implicates you in the scene and ensures you bear witness. In some respects his painting has more in common with documentary photographers today than the accepted art of his time. But they are of course an exquisite product of his times. They offer the most enlightening window into the end of the 1500s and beginning of the 1600s. But not because he was a perfect vehicle for the Counter Reformation who led the way in accepted thinking. In fact, the opposite. He bull dozed his way through his short time as a painter. His stylistic position is one of otherness, difference or rather indifference to the way things ought to be done and were being done by a host of faithful artists who had come to Rome to seek work as she glorified herself in a new age. He embodies the power struggles, drama and violence of his times. Which is why so many of his paintings were rejected – he held up an unwelcome mirror. I used to make dedicated trips to see Caravaggio, planned and eagerly anticipated. Now I live in Rome it feels ridiculous that I can pop into a church where his works sits as a permanent, glorious interruption in art history. My pilgrimages are no longer months in the planning involving flights, they happen after stopping by for a San Eustachio coffee. The repeated viewing is allowing my appreciation and understanding to aspire to new levels. I am not getting diminishing returns. In fact, I am increasingly disbelieving that they could be painted over 400 years ago. They seem to rely so heavily on two things that hadn’t even been invented then – stage spot lighting and photography. I sometimes hear tourists seeing the works for the first time ask if he worked from photographs to create the paintings. I can completely understand why they might assume they are modern if they knew nothing about them. The best place to see his paintings in Rome is San Luigi dei Francesci or Santa Maria del Popolo. Here it is possible to fully appreciate the radicalism of the composition and inventiveness of the shadow play. He did not fall victim to the awkwardness of the chapel sizes, rather he made the architecture and dictates of the commission bend to his will. But it was at the Barberini Palace recently that I had the most profound sensation with his work. I ambled through the quiet galleries drunk with astonishment that that so few people found their way here. I sat in front of a beautifully lit Caravaggio for some time and hovered dangerously close to the wall to take in every mark on the surface. I could see his hand and imagine his temperamental presence in front of the canvas. Caravaggio’s biography has been told many times – it is hard to get away from it sometimes in order to see the paintings away from the cult of his bad boy image. He was a bit of a thug, violent, argumentative, troubled and his life abruptly ended too soon while he was on the run desperately seeking a Papal pardon to return to Rome. But the part of his life that fascinates me is his origin as an artist. Where did he learn to paint? How was he able to break free from the weight of formal tradition governing painting? Once you have spent a lot of time in front of his paintings you begin to marvel at the audacity of their creation. There are big bold passages of white light that sit on the surface of the canvas that would have been radical even in the 19th century. X rays consistently reveal he did not make preparatory drawings or markings of any kind before he started painting. You can see from the surface he paints wet on wet. 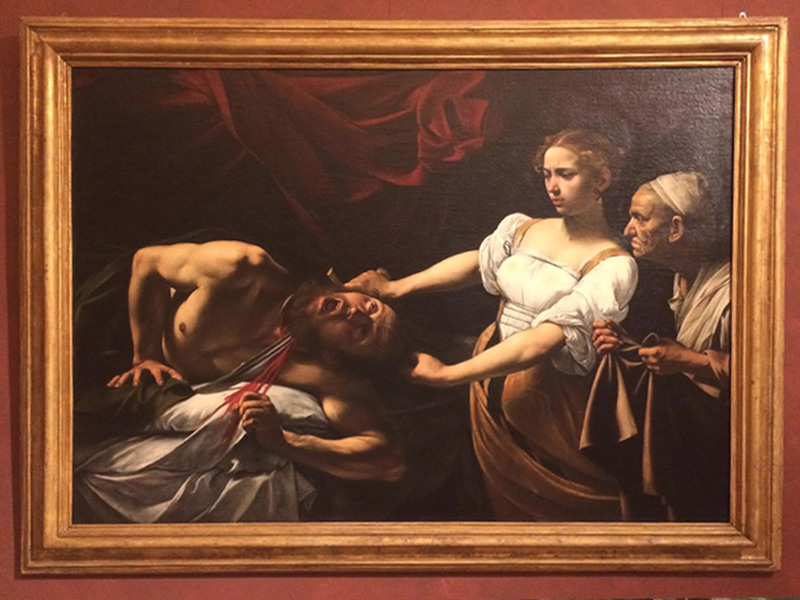 At the Barberini I was knocked out by Judith beheading Holofernes – blood gushing, bodies awkwardly committing and receiving violence. The bright red blood are a couple of energetic streaked lines – almost too clumsy until you think he was working for a dark chapel somewhere. He engineered every painting with the viewer in mind and invented a new kind of strong compositional sign posting. He ensured the viewer knew where to look, which figures should be in focus and who should remain under painted in the shadows to allow the protagonist to shine. This leads me to agree with the theory that he received no formal art education of any depth. There is hardly a trace of it in the tragically small body of work he left behind (just 70 paintings). He never produced any fresco painting and not a single drawing by his hand survives – highly unusual for his age and certainly things his well educated peers kept busy with. I think he bunked off the whole period of his supposed apprenticeship, he was probably up to no good, and as a result arrived in Rome with little to no arts education. Which I think was the greatest gift to us today. He never learnt the rules so it was so much easier to completely radicalize art.